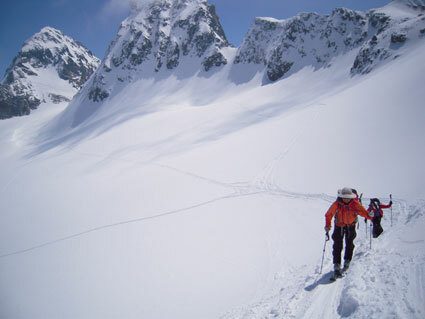 At the border of Austria and Switzerland you can enjoy some great ski touring. 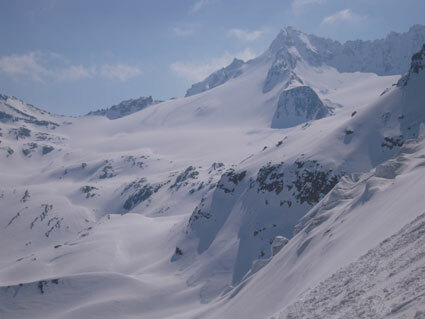 Moderate terrain with moderate ski descents between the two countries. An excellent experience you won't forget. Enjoy the Austrian hospitality and there great huts some with showers. Ski the great terrain and enjoy the famous Apfelstrudel with Vanilla sauce at the end of the day. Have some great meals such as a "Graechtel" (fried potatoes with onions and sausage) or a Williamin Schnaps. 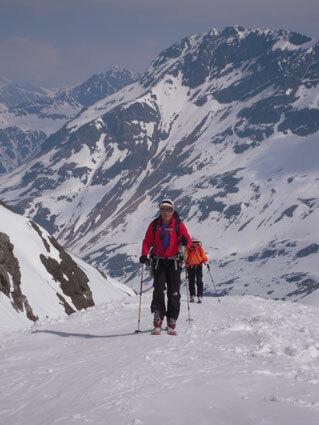 This tour is not as strenuous as others and is a great start to interduction to ski touring in the Alps. Great ski terrain in an alpine set up. If you have the confidence and skills we can peak bag as many of the peaks as you can handle depending on your skills and physical conditions! Schuls up by ski lift Piz Champatsch 2777m. skin up to the Piz Davo Lais 3027m. Overnight at the Heidelberger hut 2264m. Heidelberger hut to the Kronenjoch 2976m. if you got the energy we can climb 3 peaks over 3000 meters on the way, such as Breite Krone 3079m. Bischofspitz 3029m. and Grenzkopf 3048m. Ski down the Hut . Overnight at the Jamatal hut 2165m. Jamtal hut to the Ochsenscharte 2960m. via Jamtalerferner Glacier with the great ice falls to your left and if you fell like it we can climb the Dreiländerspitz 3197m. 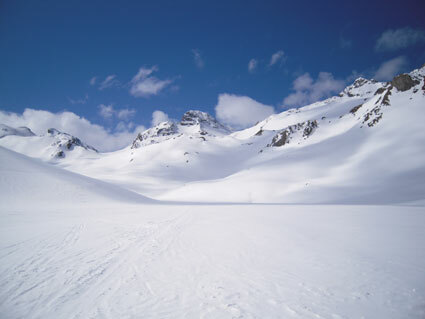 ski down the Vermunt glacier. Overnight at the Wiesbadener hut 2443m. Wiesbadener hut to the Fuorcla dal Cunfin 3042m. via Silvrettapass 3003m. or Piz Buin Grond 3312m. 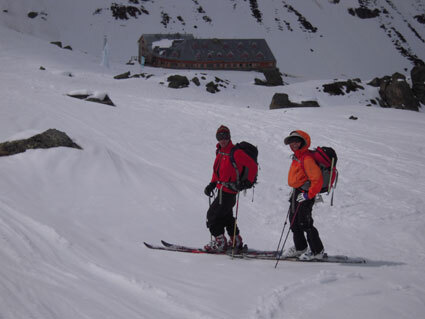 ski down the Silvretta glacier, overnight at the Silvretta hut 2341m. Silvretta hut up the Verstancla glacier to the Verstanclator 2938m. to Piz Filana 3281m. if you have very good climbing skills or we ski down the great slopes of the Plan Rui to the hut. Overnight at the Chamanna Tuoi hut 2250m. Chamanna Tuoi to Jamjoch 3078 m. ski down past the P. Forcletta over south-east facing meadows out to the town of Guarda 1653m. A very beautiful Engandin village with traditional houses and charm. May, On request I will work out your preferred date of the tour! Includes hut fees, 5 breakfasts and 5 dinners, 1 liter of tee for free, 6 days guiding. Not included: Travel expenses to and from the meeting place, no travel expenses like tram/train/taxi costs during the tour, lunches, drinks, dinners in towns, rental equipment and souvenirs. One of the many great and comfortable huts on the tour. 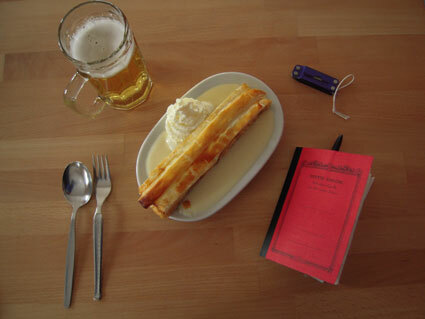 Nothing better after powder skiing a "Apfelstrudel" with Vanilla sauce and a beer in the hut. 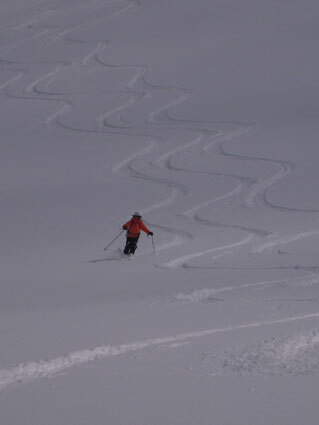 Participants must be strong skiers, PSIA level 8, able to perform dynamic parallel turns with ski randonne equipment while carrying a pack in all snow conditions: powder, hard packed and crud. I strongly recommend alpine randonne equipment for a trip in Europe. My past experience tells me that even an expert Telemark skier will struggle and have difficulty skiing with a backpack and dealing with the always-changing snow conditions. The Telemark skier is usually slower in downhill skiing, takes more falls and therefore gets tired more quickly. I highly recommend doing a level I avalanche class with AIARE (American institute for Avalanche Research and Education) to have some basic Avalanche knowledge, transceiver skills as well as touring experiences. Advanced uphill skiing techniques, experience with ski crampons as well as basic Euro-uphill kicks turn in all conditions are a necessity. Basic mountaineering skills are helpful; we may use a rope, ice axe and crampons. Bring only gear you are used to (brand new, unknown gear not ideal), broken-in in ski randonne boots, and the correct full skins. 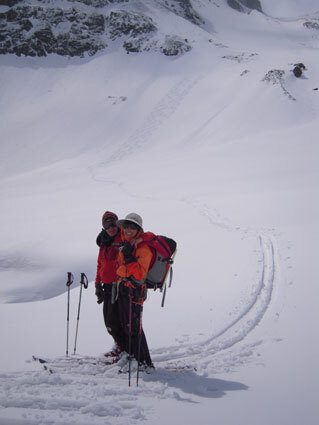 If you have any concerns about your level of skiing, mountaineering skills, please feel free to contact Swiss Guides. All of the above skills have to be solid and will be applied on the trip. 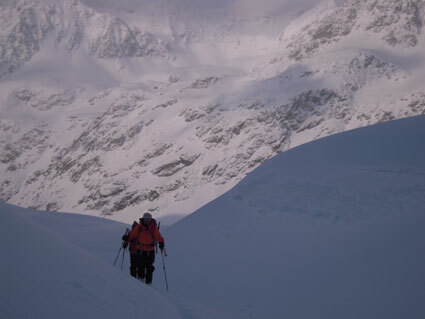 Click below for information on equipment and training plan for ski mountaineering in the Alps.